There are many different versions of the haunting of this bridge, from a woman alone, to a woman and a baby to a car crash…etc. Guess you will just have to visit and see for yourself. I’ve had three different experiences. Growing up in Bayview I’ve always heard that the bridge was haunted so one night me and my sister and her friend we stopped the car right on the bridge and rolled the windows down a s the car seemed lime it had trouble starting and it made a loud noise. The second time was a few years later me and my sister were out joy riding in the wee hours of the morning and she stops the car on the bridge and what we’ve always heard that if you turn the car off and roll the windows down ull hear something. So that’s what we did and for the first two mins nothing happened but then we heard what sounded lime footsteps running around the car and her car wouldn’t start for maybe like 5 mins and the whole time it wouldn’t start we were hearing the footsteps. And the third time me andy bf at the time walked there on Halloween night and we didn’t even make it to the bridge we got right upto the metal part and her loud noises sounded like banging and we started to walk back and a car had stopped on the bridge and we turned to look to maybe see if something would happen and there was a loud screeching noise like it was creepy. Come up 1-59 from Tuscaloosa until you reach Ensley and take the 19th street exit. Go through Ensley and cross over a large viaduct bridge next to the old Steel Mill. Once you’re over take the first right you come to. Go about 3/4ths of a mile and take a left. You’ll go through the small town of Minor,Alabama. Just keep going straight and you’ll come to this bridge over Bayview Lake. Just a little ways further on, take the next road right to go into Bayview. 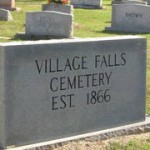 When you turn, you’ll see Village Falls cemetery off to your right. It’s also said to be haunted. This site is correct when it says there are many versions of this tale. I’ve heard at least a dozen. I was born in Bayview in 1941. My father worked at Edgewater mine. I’ve crossed this bridge many,many times,daylight and dark,storming and sunny and I’ve never seen anything. I have only lived here for 2 years. At first i was skeptical of all the rumors of this place. But I have seen her. Not on the bridge but close by. Some friends and I were at the park right down the road. One of my friends were starring off and was pale white. I asked him if he was alright and he replied, please tell me you see that as he pointed behind me. I turned around and I couldnt believe my eyes. I looked away and back at her like 3 or 4 times. She had on a long white dress with a big white sun hat. She was standing still but she had a ambient glow around her and she was starring right at us. It scared me so bad we left. Everytime I go back around there I get weird feelings.